Open the phone’s texting app. You see a list of current conversations (if any), organized by contact name or phone number. If not, press the Back icon to get to that main screen. If you see the name of the person you want to text, choose it from the list. Otherwise, touch the Add icon. You might see the New Message or Compose Message command instead of the Add icon. If you’re starting a new conversation, type a contact name or cell phone number. When the number you type matches one or more existing contacts, those contacts are displayed. Choose one to send a message to that person; otherwise, continue typing the phone number. You can add multiple recipients, if you like. Just keep adding contacts or phone numbers. Not every text messaging app offers this feature. 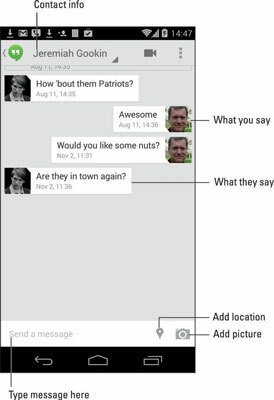 If you’re using Hangouts, you may be prompted to send an SMS or find the person on Hangouts. Choose the option to send an SMS. The figure illustrates a typical text message conversation. Touch the Send icon to send the message. The Send icon may look similar to what’s shown. If you’ve sent the message to a phone number instead of a contact, consider adding that number to the phone’s address book. One way to do that is to long-press the number and choose the command to create a new contact. You can send a text message also from the phone’s address book. Display information about a contact and touch the Text Messaging icon next to the contact’s phone number. After you touch that icon, the phone’s text messaging app starts and you can compose the message. You can send text messages only to cell phones. Aunt Ida cannot receive text messages on her landline that she’s had since the 1960s. You can send a single text message to multiple recipients: Just type additional phone numbers or contact names in the To field when you’re composing a new message. When you receive a group message (one that has several recipients), you can choose whether to reply to everyone. Look for a Reply All button when composing your response. Continue a conversation at any time: Open the phone’s texting app, peruse the list of existing conversations, and touch one to review what has been said or to pick up the conversation.